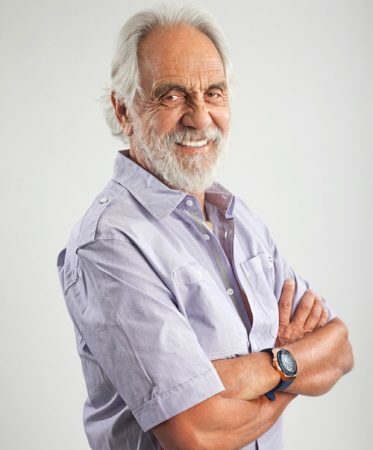 Tommy Chong has had many identities in his decades-long career: comedian (he’s half of the Grammy Award-winning comedy duo Cheech & Chong), actor, musician, cannabis activist and “Dancing With the Stars” contestant. Another new addition to that list? Cancer survivor. Under the care of Kevork Kazanjian, MD, chief of Colorectal Surgery at UCLA, Chong was recently treated for colorectal cancer at the UCLA Colorectal Cancer Treatment Program at the Ronald Reagan UCLA Medical Center. In honor of National Cancer Survivors Day on June 5, Chong talked to us about fighting cancer with humor, attitude and a great medical team. I just finished treatment about a month ago. I’m cancer-free right now, free as a bug, and I’m feeling incredible. What was it like to be diagnosed? Did you seek treatment right away? My medical team removed the tumor almost immediately after discovering it. I underwent radiation for about a month, and then had surgery. I found that UCLA is really the best place to be treated: the best surgeons, the best care and the best attitude. For about a year, I was on chemo pills, 20 days on and then a week off. It was a short struggle –­ a short bump in the road for me. Why do you think your recovery has gone so smoothly? I’ve always been very active. I’ve been an avid bodybuilder since I was 16 or 17 years old. I still exercise – I bodybuild, I play golf. Here’s what I’ve learned, especially with weight training and playing golf: We are masters of our own ships. We decide whether we’re going to be healthy or sick, happy or sad. By keeping a flippant attitude during hard times, your body responds to how you perceive yourself. So humor has played a big part in your cancer journey? Since I got [colorectal cancer], they had to rearrange the plumbing. I went from having a normal bowel movement to having a colostomy bag. As a comedian, I’m working up a routine about the pros and cons. With comedy, I’ll take any kind of problem and make it a joke. Then it’s no longer a problem. It’s part of a routine. There’s still stigma and misinformation about colostomies. What has that part of the experience been like for you? Look at the alternative: If you don’t do it, you’re dead. It’s actually a plus in my life. I no longer spend agonizing minutes sitting on the toilet. I can walk into a restroom, and within seconds, change everything. It’s no problem physically. It’s a drag as far as the look goes. I’ve got a lump that you can see through a T-shirt. It’s inconvenient, but really such a slight inconvenience. It’s keeping me alive and will for many years to come. I look at everything as a blessing. Do you have any advice for those at risk, or for others who are fighting cancer? If you suspect there’s something wrong, go get checked out immediately. Don’t make up stories. Don’t be afraid of being checked out. It’s better to know the truth. Sickness is a learning experience. The miracles that happen come from within. That’s what I’ve found out, and that’s the way I live my life now. It’s all attitude. I’m living proof that humor will get you through everything. For more information about your screening options, watch this video about colon cancer screening.